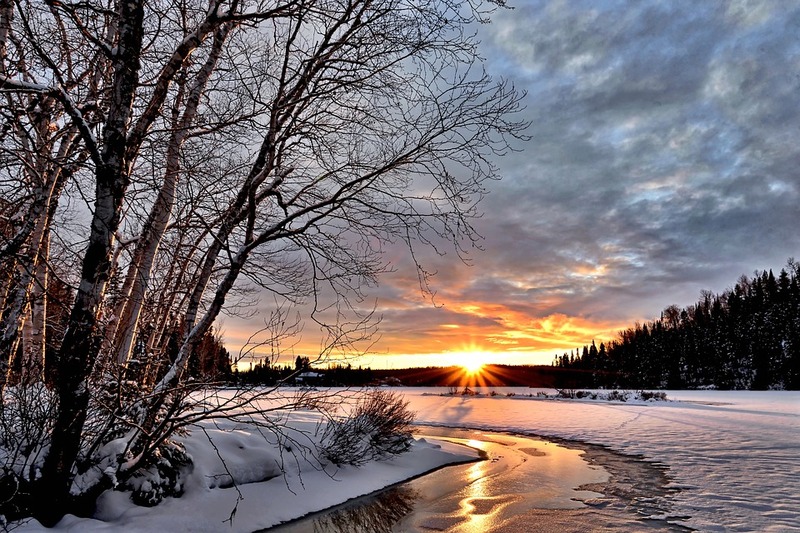 It’s that time of the new year when the winter doldrums can set it – weather and routine can weigh everyone down. Along with that, there’s that old cliché about “all work and no play”. There’s little risk of our medical students being thought of as anything approaching dull and they provide great ideas for how to beat the winter blahs. In addition to their full class and study load, they make time for a wide variety of extra-curricular activities for fun, recreation and community involvement. In early January, 68 pre-clerks attended the annual MedGames in Montreal and placed 2nd of everyone outside of Quebec. Sponsored by the Canadian Federation of Medical Students (CFMS), MedGames brings together medical students from across the country for a friendly sports competition and network building. Thirty-one second year students competed in BEWICS. This is the annual Queen’s Intramural sports competition which features a variety of self-proclaimed “quirky” sports such as water volleyball and rugby basketball. The QMed team placed third overall for competitiveness and spirit. The Class of 2021 Class Project Committee hosted Queens’ first ever Scholars At Risk Talk (see more on this here). Pre-clerk students recently competed in the Ottawa’s Winterlude Ice Dragon Boat competition and about 30 went on the annual ski trip to Mont-Tremblant two weekends ago. And if ice dragon boating and skiing weren’t enough of a challenge, about 45 students from across the four years spent a couple of hours recently learning the basics of curling from a fourth year student. This is the fourth time for this event! For Wellness month, the Wellness committee put together a month of activities with each week having a theme: social, physical, mental and nutritional wellness. During physical wellness week, 40 pre-clerks did a Crossfit class and 20 did a spin class taught by the AS Wellness Officer. The 2nd annual Jacalyn Duffin Health and Humanities conference happened recently and was very well received. This past weekend, 20 students went to NYC to learn about the history of medicine, led by Dr. Jenna Healey (Hannah History of Medicine Chair) and the What Happened In Medicine Historical Society. This past Sunday afternoon, I had the pleasure of attending the Kingston Symphony’s matinee performance of Gene Kelly: A Life in Music at the Grand Theatre. The show featured clips from Kelly’s most memorable performances, with live musical accompaniment by the symphony, under the direction of Evan Mitchell. Throughout the show, Kelly’s wife and biographer, Patricia Ward Kelly, shared anecdotes and Kelly’s own insights into his choreography and performances. She talked about the work he put into creating dances, painstakingly writing out the choreography plan, before working with his fellow performers to perfect the dances themselves. “He didn’t just show up and wiggle around on the stage,” she said. My educational developer lens instantly compared this to the framework provided by well-written learning objectives. Objectives focus teaching and learning plans, and contribute to authentic assessment. Yes, this is another blog about learning objectives. In the abstract, learning objectives seem like just another box on a checklist or hoop to jump through. Used the way intended, however, they are signposts that guide learning and teaching plans effectively—whether for a class or a single person—the same way Kelly’s planning delivered award-winning and inspiring choreography. Yes, there’s a “gold standard” for writing objectives (that I’ve written about previously here). And there are verbs to use—and ones to avoid—and if it doesn’t come naturally to you to think this way, it can be pretty tedious. What it’s really about is planning: knowing what you’re setting out to do. If you have an objective—a goal—then you can make your plan and communicate it to others effectively. Well-crafted objectives also make things great for assessment, because it’s very clear what you have to measure at the end of the lesson, course, or program. 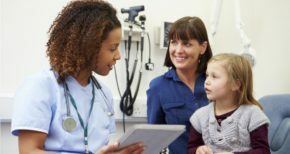 If you say, “I’m going to get better at taking patient histories” – what does that mean? What does “better” look like? If it means, “I’m going to note down details, or I’m going to ask specific questions, or I’m going to listen more than I have been, or interrupt less… then you know what you need to work on. You know what the focus needs to be, whether you’re a learner or a teacher. Eventually, you’ll be able to do a history without thinking things through so deliberately – once you’ve achieved fluidity in that skill. But before it’s a habit, you need to plan, your checklist, and I’m hitting all the boxes? Not just: “be better”. For example, one of my plans in 2018 was to read more books that weren’t medical education and weren’t related to my PhD coursework. “Read more for fun.” That was it. My objective was pretty vague and, as a result, I didn’t create a workable plan. “Read more” didn’t get me very far. 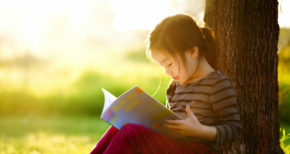 I read parts of eight non-work-related and non-course-related books. And three of those were cookbooks. I set a more specific objective for 2019 that I would read more by spending five minutes every morning before I left for work reading something from my “recreational” “to be read” book stack (mountain). I’ve finished two books, which is already a 200% improvement over last year. That specificity can make a difference. And that’s really all objectives are: an outcome statement to focus your plan. And that’s why we focus highlight objectives in our competency framework. It’s why we map things to them—learning events, assessments, EPAs—so we can be consistent and everybody knows what the plan is. How much detail do you need in your objectives? This depends on how granularly you need to communicate your goals in order to be effective. 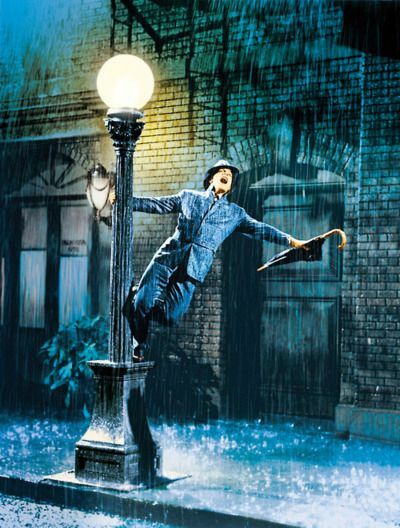 For his iconic Singin’ in the Rain, Gene Kelly had to map out the location of each of the puddles. His plan needed to be that detailed to get it right. If you’re wrestling with learning objectives and how these relate to your teaching, give me a call. In his keynote address at the UGME fall faculty retreat on December 10, Dr. Gary Tithecott addressed the topic of Leading change for success in medical education during challenging times. Dr. Tithecott is Associate Dean, Undergraduate Medical Education at Schulich School of Medicine and Dentistry, Western University. During his presentation, Dr. Tithecott cited a few books and mentioned others as worth delving into. As I like to do here, I’ve created a “Top 5” list from those he mentioned (OK, it’s actually six books, as he recommended two from a single author). These books are practical and accessible reads with clear advice, he said. There’s still time to add some or all of these to your holiday wish list. 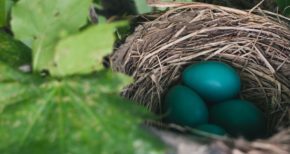 The traditional attitude – Fixed Mindset – dictated that your fate is determined by skill you have genetically and that you demonstrate, Dr. Tithecott explained. With a Growth Mindset , by contrast, asserts that with dedication, encouragement and effort you can learn from and with others to increase your ceiling. Grit, in a word, is stamina. But it’s not just stamina in your effort. It’s also stamina in your direction, stamina in your interests. If you are working on different things but all of them very hard, you’re not really going to get anywhere. You’ll never become an expert. OK, this is actually TWO books, not one. Noting that no talk on change and change leadership is complete without including Kotter, Dr. Tithecott recommended both Leading Change and the more recent XLR8. The symbolism of leaders eating last – exemplified by the US Marine Corp chow line, described by Sinek – points to leaders who put their team first. This in turn, leads to more acceptance of the challenges of change, Tithecott said. Leadership can be found in different places and doesn’t necessarily mean the person “at the top”. Where and how leadership for change can be developed can vary, Tithecott said, recommending Sharma’s book. Nominations for the third iteration of the Kingston Health Sciences Centre (KHSC) Exceptional Healer Awards are open with a deadline of December 14. 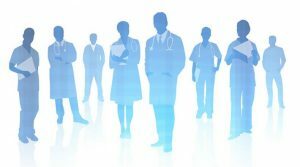 Launched in 2017, the Exceptional Healer Awards are sponsored by the KHSC Patient & Family Advisory Council and was designed to honour a physician who demonstrates in clinical practices the core concepts of patient- and family-centred care: dignity and respect, information sharing, participation, and collaboration. Prior honorees include ophthalmologist Dr. Tom Gonder and anesthesiologist Dr. Richard Henry (2017, tie) and urogynecologist Dr. Shawna Johnston (2018). The award has been expanded this year to include one for physicians and one for nurses. Physician nominees must, as a faculty member at Queen’s, have a current appointment at KHSC and have been credentialed at KHSC for at least the past two years. Nurse nominees must be KHSC staff members. Patients and family members can nominate a KHSC physician and/or nurse who have provided care to them in the last two years while KHSC staff can nominate a physician and/or a nurse on a patient care team. For the 2018 award, patients, families and staff nominated 21 physicians for the award. Thirty-four nominations were receive, with about 25 percent coming from KHSC staff. Medical students and nursing students are eligible to submit nominations in the “staff” category. 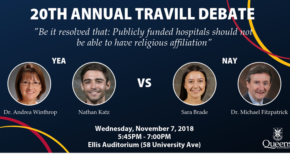 The 20th annual A.A. Travill Debate is set for November 7 in the Ellis Hall Auditorium, 58 University Avenue, beginning at 5:45 p.m.
On the “Yea” side, arguing for the proposition will be Dr. Andrea Winthrop and Meds 2022 student Nathan Katz while Dr. Michael Fitzpatrick and Meds 2021 student Sara Brade will argue the “Nay” side. 10 minutes for each member of the team, alternating back and forth – Yea and Nay – until all four participants have laid out their arguments. Then two minutes for summary from one member of each side. The Travill Debate Gavel is banged very loudly when the time limits are reached. No Power Point or technological aids. Humour is welcome. Formal attire and costumes have also been used to good effect. Dr. Travill came to Canada in 1957 after serving as aircrew in the RAF (WWII) and reading Medicine at the London Hospital Medical School. He did a residency year in Montreal and practised in Orillia with Dr. Philip Rynard (Queen’s ’26) before coming to Queen’s to study Anatomy under Dr. John Basmajian. 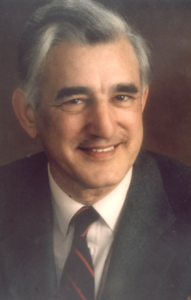 After two years at Creighton University in Omaha, Nebraska, Dr. Travill returned to Queen’s in the Department of Anatomy in 1964, becoming Professor and Head from 1969-1978. His research interests were in embryology, teratology and education. Dr. Travill was a strict parliamentarian and noted Faculty Historian (Medicine at Queen’s; 1854-1920, the Hannah Institute for the History of Medicine, 1988: Just a Few: Queen’s Medical Profiles, 1991). 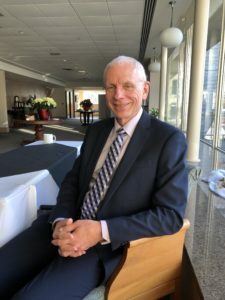 He served the community as a Trustee of the Separate School Board and in 1964 was a founding member of the John Austin Society, the still thriving local history of medicine club. In particular, Dr. Travill had a passion for debate on current social, political and educational issues, and for many years he delivered a rigorous and challenging lecture to incoming first year medical students during orientation week. This is one question I get a lot as an educational developer, with a quick follow-up one about what’s the best way to put slides together. Soon after it was first released in 1987, PowerPoint became both a boon and bane for teaching. (There are other software programs; PowerPoint just has well over 90% of the market). Computer program presentation software is certainly way more convenient than its predecessor overhead projector (and the accompanying slippery stack of slides), but it’s perpetuated some of the previous challenges with ill-conceived overhead transparencies while creating its own new issues. 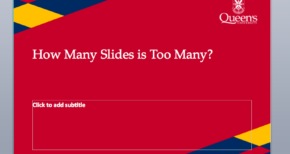 Like how many slides is too many? The standard advice is the 10/20/30 rule: 10 slides for a 20-minute presentation with 30-point font. This avoids the too-much issue: too many slides and too much information crowded on a single slide, but it’s simplistic advice that may not address your actual concerns. How are your learners going to use them? What else are you going to provide? For example, are you using your slides as “attention getters” or information notes? Do you need an eye-catching image, or clear bullet points, or both? Are your images essential illustration, or distracting add-ons? 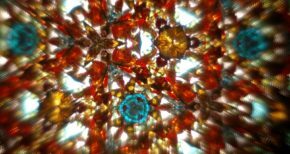 If you’re showing a complicated image, is it to show “it’s complicated” or is it for detailed discussion and deeper learning? Take a step back and think about how your slides look projected on the three screens in the teaching theatres. Are your slides overwhelming or illuminating? Are your learners going to take notes on their electronic copy of your slides while you talk? Will these be their primary reference? Are your slides “must use” or “nice to have”? Do you provide an electronic copy of your slides, before or after class? Are they complete or are there things omitted in your MEdTech published versions (either for pedagogical or other reasons, see next point!). If you’re using more visual versus text sides, are you providing accompanying notes? Do the students have other resources? Issues about accessibility, copyright and confidentiality will vary based on particular circumstances. The best rule for layout is “keep it simple” – many of the built-in templates in programs don’t translate well to the screen and can be impossible to read for some people with particular vision problems. There can be issues of copyright for images – some things can be shown in class, but not saved to our learning management systems, for example. (And we have a copyright specialist here at Queen’s – Mark Swartz – who can help us navigate this). Also, regarding confidentiality, if screenshots of x-rays are used, for example, how is identifying information removed? There are a vast number of resources online and multiple great reference books with tips and techniques for improving your use of presentation software. There is no single school of thought of best practices for teaching with this tool (although there are definitely pitfalls to avoid). If you’re looking to improve your use of PowerPoint in the classroom, please feel free to get in touch. We can look at what you’re doing now, what your goals are, and talk strategies for changing things up as needed. Meanwhile, if you have 14 slides for a 20-minute presentation, you’re likely ok. But if you’re planning 200 slides for a 50-minute lecture, chances are, that’s too many. Call me.